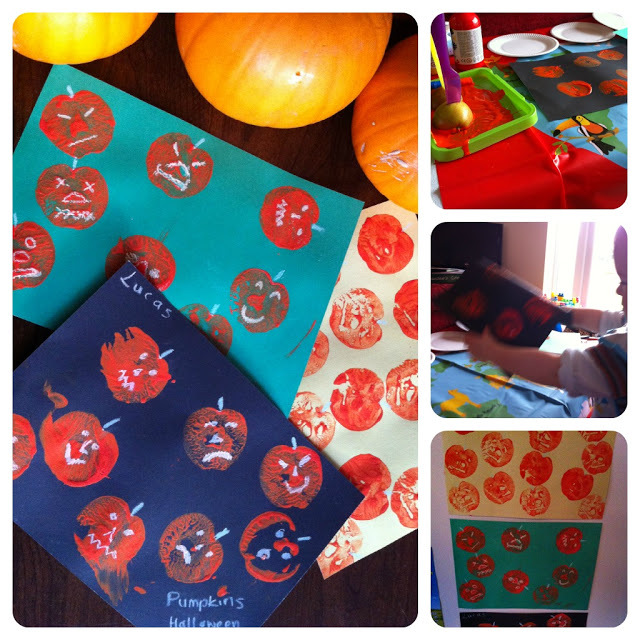 It isn’t long till Halloween and to celebrate we’ve been doing some pumpkin art – pumpkin prints! I bought some pumpkins we’ll be experimenting with later this week but we had a go at some printing today to decorate the house. I cut a small apple in half; to make it easier for little fingers to grip I had some plastic children knives that I stuck in the apples to use as a handle. We mixed some paint together in a tray (Lucas enjoyed the mixing) then pressed the apples in the paint and printed the apple onto some black paper. I cut a face design on the bottom of one of the apples so the prints showed a spooky face. We tried printing on some different coloured paper but the black was definitely the most effective. Once the paintings had dried I chalked some menacing faces on them. It didn’t take long to set up and Lucas enjoyed the printing although he was tempted to run off with the painted apple! We had plenty of orange paint left over so we also painted a few paper plates to make into pumpkins. All the painting had tired Lucas out so while he had a nap I stuck some googly eyes on the painted plates, cut out a mouth and stuck some coloured paper behind. Then I added some green stalks and stuck the pumpkin plates up on the window. When he woke up he made a beeline straight for them and he now enjoys taking them down and sticking them back on the windows. Our house is now a Pumpkin Paradise! I like being able to decorate the house with things that we have made. Do you have any other good ideas for Halloween activities? I’d love to hear about them and give them a go!